Made for Chefs by Chefs. 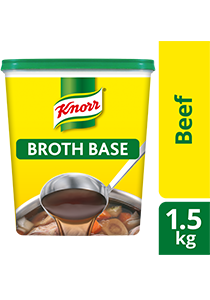 Knorr Beef Broth Base is made with quality beef, blended with spices to give you that full bodied meaty flavour and beef aroma. With a delicious meaty flavour, you can also use Knorr Beef Broth Base to replace bones and meat as desired, especially in stocks, soup dishes, stews and hot pots. For beef stock with the basic beefy taste and light soup color, dilute 15g of Knorr Beef Broth Base per 1 Litre of water. For a full-flavoured and more intense beef stock, dilute 22g per 1 Litre of water.